In a world of more choice and opportunity than ever before, how we spend our time can lead us to fulfilment or to spiritual disconnection. Part memoir, part case study, The Me, Without is an inspiring example of how to step back, slow the pace of life and help yourself heal. At the age of thirty-four, journalist Jacqueline Raposo finds herself sick, single and broke. 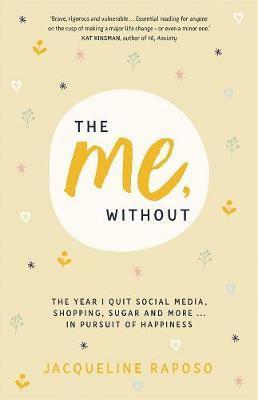 Weary of trying to solve her problems with quick-fix products and adding things to her life to bolster her self-esteem, Raposo attempts the opposite and subtracts some of her most destructive habits - social media, shopping, sugar and negative thoughts - for periods of thirty to ninety days over the course of one year. The result is a soul-searching, deeply moving story of self-improvement, full of fascinating insights from doctors, psychologists and science experts about why our brains and bodies react as they do to our habits, and how we can all work to develop more satisfying, calm and meaningful lives.